At a client holiday party last week, talking to a marketing director at the bar and the subject of Occupy Wall Street comes up. “I’ve been working with a friend to create some Occupy graphics, maybe even sell them and give the money to the movement,” I said to her. She was angry with the Occupy movement and I didn’t argue with her, because her anger didn’t seem unjustified to me. At the same time though, the opposite might also be happening – some small businesses doing better because of the Occupy attention. Still, being a small business myself, I certainly don’t want Occupy to be hurting anyone in the 99%. So, to me, her anger made sense, but Occupy makes sense to me too. Every established system around us doesn’t seem to be working very well these days and Occupy could possibly encourage us to imagine systems that do work. A “place” to start… and even though many pundits feel it’s not a movement at all, and that is has already been compromised, I’m seeing it in a different way. My friend, Thomas Alan Berg (author of “Uncle Tom’s Classroom”) a visionary educator, has participated in the San Francisco Occupy and felt that the feeling in the air was much more than political, much more than economic. The only way he could describe it was to say it felt like a kind of connection was everywhere, going far beyond the original purposes of the physical protest. Tom Berg’s description of his experience at Occupy San Francisco inspired me to create this particular graphic, because he expressed the “heart” part of Occupy. Feeling our own heartfelt connection (to each other, to this place we live called earth etc…) is the invisible force of Occupy. Everyone has their own relationship to that; it’s an individual thing. No leaders, no followers. Facilitators, consensus, respecting individuality and differences…sounds too good to be true as a real working system, and I’m sure it’s also messy to manage. But first steps are almost always shaky. Occupy might be helping us see the first social description of a new paradigm and since we have no idea what to really look for if this is REALLY going to be different from what we’ve known before, so it’s too soon to tell. One thing for sure: Monsanto, Big Pharma, Big Media and our Banking systems would like it much better if everyone just shut up so they could continue to monopolize the world as we know it now…in our “best” interests. 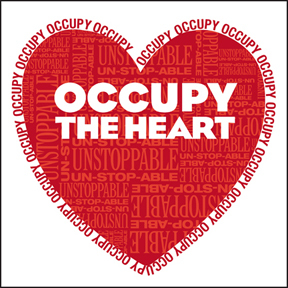 Occupy the Heart is a reminder that our feelings are not only significant, they are at the basis of everything we do; our emotions are the human currency we exchange with one another, every day, at our desks, counters, board rooms and these feelings make our lives “better” or “worse”. By paying attention to this fundamental “invisible” part we all have, I think we have a better chance of making a “permanent” difference on the place we (presently) call home, good old planet Earth. It’s not like we have to put differences aside entirely, we have to understand them for what they are finally…a million different expressions of what is really a beautiful and unstoppable heart, the invisible force of the universe. Am I a dreamer? You bet. And all the best minds of any generation are, too. Love to you all in this season of celebration…more in 2012!